China's poor air quality undoubtedly damages its economy in many ways. A GDP analysis in 2004 estimated that the cost of pollution in China was US$66 Billion, 3% of the nation's GDP at that time . Pollution by air doubtless accounts for a significant portion of the total cost. There are many factors that contribute to economic damage through air pollution. The largest factors are environmental damage dealt to crops, and material damage dealt to infrastructure. Figure 1. 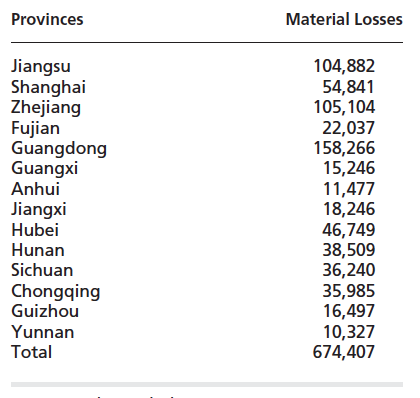 Comprehensive table showing loss of various crops in China. Obtained from World Bank, 2003. A major cause of economic damage is the reduction of crop yield and growth in the agricultural industry. As previously mentioned, smog and acid rain can drastically hamper the growth rate of popular crops such as wheat, corn and rice. A study conducted by World Bank estimates that environmental damages suffered in terms of crops accumulate to approximately $30 Billion RMB. The damages are primarily a result of acid rain and ozone interference on the growth of crops. China, as a large exporter and consumer of such crops, suffer economic damage through the reduction in yields . Figure 1 shows the economic consequences of acid rain, sulfur and ozone across the nation of China. The table, obtained from World Bank, shows the economic impacts derived from various different crops, paired with the the country's largest cities. The table shows that the effect of crop reduction in terms of location is comprehensive, and not limited to a certain area or city. We can also see that the effect of smog is also comprehensive in terms of the types of crops affected. The table shows that China's largest crops are all affected by the smog. The values shown in the table is given as 10,000 RMB per numeral. Hence, Figure 1 shows that the total economic damage dealt is approximately $30 Billion RMB . Figure 2. Table showing percentile loss of timber stocks. Obtained from World Bank, 2003. Forest damage is also a factor in economic consequences. Acidic deposition has led to the loss of forest quality, and can reduce the area of forests drastically where acid rain is highly prevalent. Studies have shown that acid rain has large impacts on coniferous forests, and are capable of clearing forest land. A major issue with forest damage is the inability to directly calculate a quantitative economic value regarding the damage. Although the loss of timber as a result of smog can be calculated, the price of forests expand far beyond timber prices. Forests provide ecosystems, prevent soil erosion and entail many benefits to an economy that is not readily calculable. Hence, the true damage of forest reduction cannot be definitively calculated, and is somewhat bound by one's subjection. Figure 2 shows the annual timbre stocks and density in the forest, across some of China's cities with forests nearby. The two types of forests investigated are the Masson Pine and the Chinese Fir - both of which are coniferous, and vulnerable to acid rain and sulfur dioxide. Figure 2 also shows the percentile reduction of timbre stocks after being affected by acid rain and sulfur dioxide. The table shows that both types of forests are negatively affected, and the severity in the reduction actually depends on the affected location . Smog causes comprehensive damage to infrastructure of China. The main cause of damage to infrastructure is the infamous acid rain. China's highly acidic rain slowly wears away at many materials through long-term corrosion. The corrosion mainly occurs on non-metallic substances such as cement and brick, but higher acidity levels of rain can corrode metals. A study by the China State of Environmental Protection Administration states that material damage as a result of acid rain is estimated to be $6.7 Billion RMB every year . This was calculated through measuring the amount and types of exposed building materials, and then calculating the corrosive properties of acid rain over a year. The economic damage did not include the non-material costs required to construct new buildings due to increased rate of corrosion. Therefore, the cost of actually replacing corroding buildings is misrepresented in the stat. A study by Environmental and Science Policy compared China's corrosion rate with that of Japan. It found all materials corroded significantly faster in China than in other East Asian countries. The study states that metals corroded up to 4.5 times faster in China than Japan . 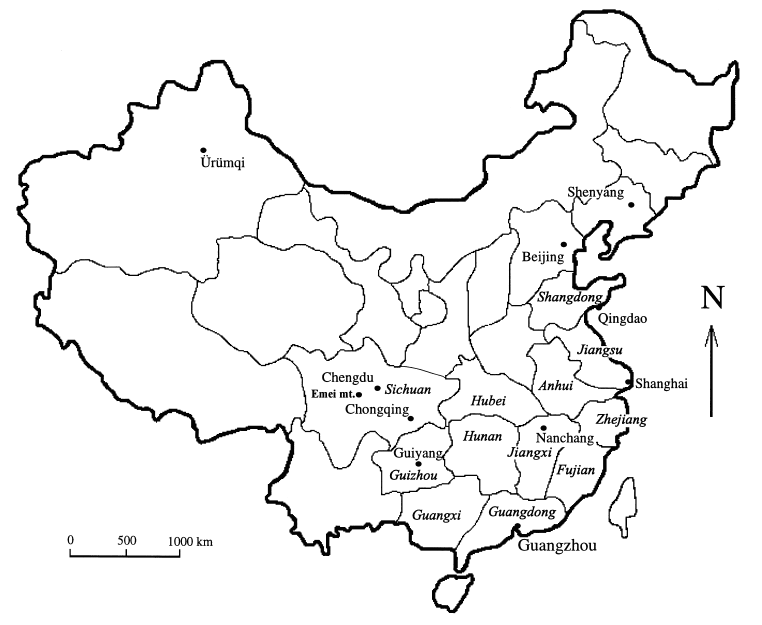 Figure 3 shows the map of China with the states affected by acid rain named. Cities affected most by the acid rain are dotted on the map. From Figure 3 we can see that acid rain mostly affects the Eastern border and Mid-Eastern centre. This is likely to be a result of the Eastern border being more humid than the West, resulting in more rain . Figure 4 is a table displaying the loss of material due to corrosion in various states of China. The stats represent 10,000 RMB per numeral. According to the table, the material damage dealt accumulates to $6.74 Billion RMB. From the table, it can be seen that usually the wealthier states suffer more economic material damage compared to the poorer states. Guangdong, for example, is by far the largest and wealthiest state in Southern China, which also coincidentally suffered much higher material loss. It can also be seen that provinces closer to shore are more affected compared to inland provinces . Figure 3. Map of China showing areas most affected by acid rain. Obtained from Environmental and Science Policy 1999. Figure 4. Table showing cost of material loss. Obtained from China State of Environmental Protection Administration.